Most dogs and cats take to hydrotherapy in the underwater treadmill really well, even those who are not normally keen on getting their paws wet! Hydrotherapy is the use of water as a means of treatment and we have found the underwater treadmill or water-walker to be very useful for many conditions. Hydrotherapy is ideal if you need to improve your pet’s fitness or when they need to build up muscle or improve mobility due to injury or illness. At Active Pet we often advise using the underwater treadmill if your pet has arthritis, hip/elbow dysplasia or after neurological injury and orthopaedic surgery. Most dogs and cats find the underwater treadmill a lot less scary than a swimming pool and even pets who do not usually like getting their feet wet take to the treadmill ‘like ducks to water’! We are able to get in the underwater treadmill with your pet so we can make sure that they are using the underwater treadmill safely and if we need to we can help them put their feet in the correct position so that they are able to walk properly. Smaller dogs and cats are able to swim in the underwater treadmill and it is even possible to use the treadmill without any water in it! Water enables pets to bear less weight, which reduces the load on painful joints and often allows them to do certain exercises or movements that are unable to do on land such. Some pets are able to stand or use a painful leg in the water which they are unable or unwilling to when they are on the ground. When you pet isn’t as mobile as normal hydrotherapy will help keep their joints active, maintain muscle mass and improve proprioception/balance. As some pets are confined to a room or crate/cage using the underwater treadmill will also prevent boredom and frustration at not being able to get about as normal. Hydrostatic pressure is the pressure that is exerted on the body when it is immersed in water and it helps decrease oedema, which is great for any areas of post-operative or arthritic swelling. Most pets find the effects of the warm water to be soothing on their sore and tired, joints and muscles as is also has a massaging effect. Water resistance can be used in dogs for muscle strengthening and cardiovascular training. For active and working or performance dogs hydrotherapy provides a way to introduce cross-training into their fitness program and helps to provide them with a new and different challenge to their muscles and mind. Cross-training helps to prevent injury in the same way as it does in people by providing a whole-body workout so that one group of muscle is not neglected at the expense of building up another. Hydrotherapy can be used as part of a balanced weight management program and is excellent for helping those dogs and cats with osteoarthritis who find it too difficult to exercise on land to lose weight. For dogs, cats or rabbits with arthritis, spondylosis or hip/elbow dysplasia it helps increase muscle strength and improve joint function. Hydrotherapy may be utilised when your pet needs rehabilitation following orthopaedic surgery such as after a fracture repair, cranial cruciate rupture or joint replacement. It works very well when your pet has had a neurological injury, such as degenerative myelopathy, fibrocartilagenous embolism or after intervertebral disc surgery, to help them to learn how to walk again and maintain muscle strength. Lots of dogs find the challenge of doing something different mentally stimulating and for those active dogs who are unable to run around due to illness or injury it provides a safe workout for both mind and body. 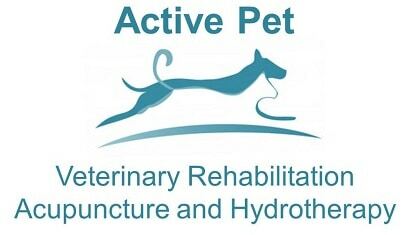 At Active Pet your dog, cat or rabbit will be supervised by a fully qualified Veterinary Surgeon or Veterinary Physiotherapist so we are able to understand your pet’s unique needs and concurrent conditions. In the right hands hydrotherapy can be an excellent adjunct to other treatments but we believe it is important that your pet is monitored by someone who has intimate knowledge of veterinary anatomy and physiology as if used incorrectly or inappropriately then there could be detrimental consequences. You are more than welcome to bring your dog for hydrotherapy only and each pet will undergo an assessment to check that hydrotherapy is suitable for them and we will need to have permission from your normal Veterinary Surgeon. Pets that have diarrhoea, open wounds or sores or are unwell at the time of their appointment will be unable to have hydrotherapy. 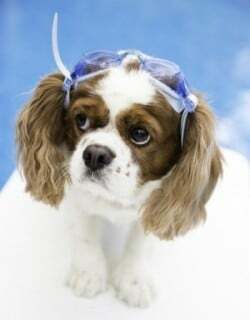 All pets need to be up to date with their vaccinations before they can commence their hydrotherapy program. Pets with certain medical conditions or those that are on certain foods may not able to have hydrotherapy and we are happy to advise on whether this may be the case. Please make sure that your pet has been to the toilet before their session and that they are clean and mud-free. The underwater treadmill can be used as part of a balanced exercise and strengthening program to help restore and improve mobility and function and we will advise you if we think that hydrotherapy is appropriate for your pet and their condition or whether there would be a better, safer alternative. If you are wondering whether hydrotherapy would benefit your pet and would like further information then please call us on 01494 725968 or email via our contact page.